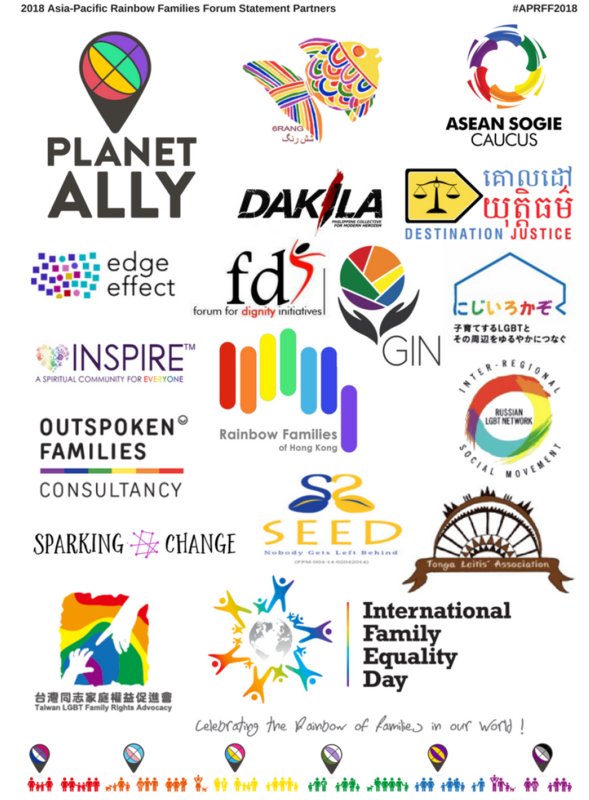 Hong Kong, 1st June 2018 – This joint statement was developed over the course of the 2018 Asia-Pacific Rainbow Families Forum (APRFF2018), held from May 11th – May 13th 2018 in Hong Kong, by Asia and Pacific community organisations, allies and independent advocates. APRFF have chosen to release this statement to coincide with the United Nations Global Day of Parents, a day observed on the 1st June every year since the adoption of the United Nations General Assembly (UNGA) resolution A/RES/66/292. Based on Article 16 of the Universal Human Rights Declaration (UDHR), it honours parents throughout the world for their selfless commitment to children and their lifelong sacrifice towards nurturing this relationship. Rainbow Families are families headed by LGBTIQ+ or SOGIESC identifying adults, with children, or those seeking and planning to have children. We as Rainbow Families representing the Asia-Pacific region, wish to highlight the importance of visibility, engagement, full inclusion, safety and health of our families, and all the individuals who make up these families, within communities and jurisdictions of the Asia-Pacific. We believe that Rainbow Families are formed in a myriad of ways, and above all seek to support the positive development of children to become thriving and contributing citizens by providing loving environments that are safe, developmentally appropriate, and provide for all the children’s basic needs. short-sighted legal means, but inclusive of those formed through adoption, kinship, foster care, surrogacy, and out of emergency need focused on the needs of children. Recognise and fully integrate Rainbow Families as an established family unit in all our communities. Other specific social and health supports needed by Rainbow Families within the SOGIESC community context. Highlight the need to access, participate in, contribute to and benefit from social, political and economic systems to ensure the development of equity and equality for all Rainbow Families. We support the idea that as the center of humanity’s social life, families are the bedrock of any functioning society. The family unit acts to protect, nurture and support children, help children to avoid poverty and hunger, promote the health and well-being of all members, and reciprocally supports strong communities and society. In conclusion, our entreaties contained in this statement are not requests for new rights or additional privileges, but are simply to equalise laws and policies to ensure that all families are recognized, can thrive and contribute to the greater good of society.. Finally, we are thrilled to officially announce that the next Asia-Pacific Rainbow Families Forum will be in Tonga July 2020 and hosted by Tonga Leitis Association and organised by Planet Ally and IFED. See you there! The first International Family Equality Day (IFED) was launched in 2012 as a sign of solidarity and pride to promote equality for all families. The 7th International Family Equality Day in 2017 was commemorated in 102 towns and 44 countries worldwide, whether on a smaller scale with picnics, gathering together, celebrating in safe spaces or with big public events. The Council of Europe recognises the IFED as an important tool to combat homophobia and transphobia and to promote a tolerant and cohesive society. The Global Day of Parents is observed on the 1st June every year. The Day was proclaimed by the UN General Assembly in 2012 with resolution A/RES/66/292 and honours parents throughout the world. The Global Day provides an opportunity to appreciate all parents, in all parts of the world, for their selfless commitment to children and their lifelong sacrifice towards nurturing this relationship.